Last week I promised you some healthy recipes for January but got off to rather a bad start by failing to photograph the dish I planned to post. 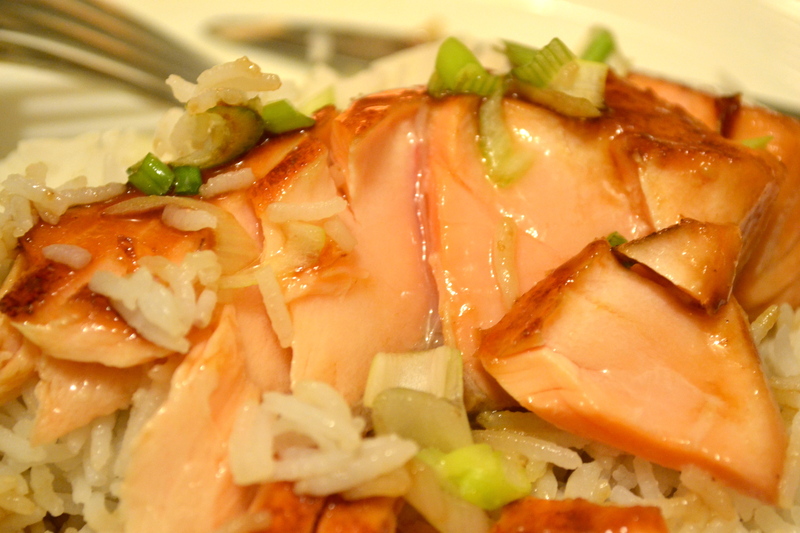 So in the spirit of “better late than never”, here is healthy recipe number 1 of the week: Mirin glazed salmon. The recipe is from (she drops her voice to a whisper) “Nigella Express”. I’m not sure whether I should really admit to cooking Nigella recipes after her fall from domestic goddess-dom in recent months, but this one really is too good not to share. It’s another super easy and super speedy recipe for mid-week meals and it’s full of omega 3 goodness. 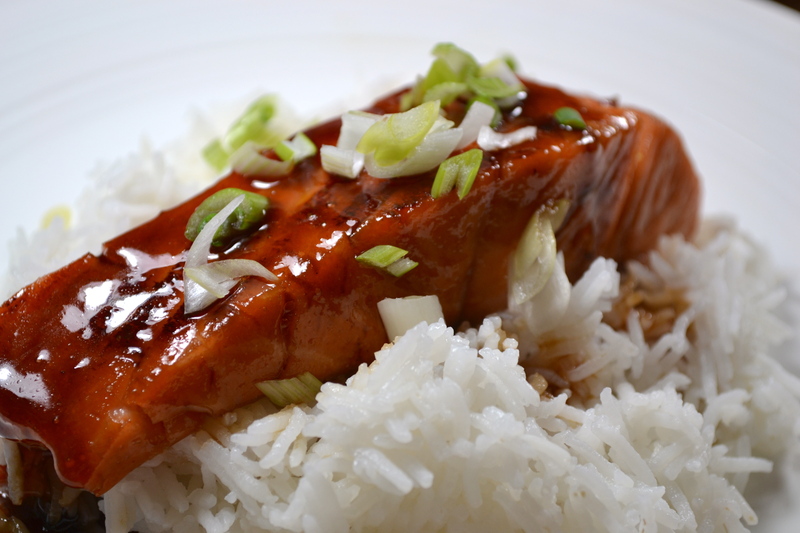 All you need to do is whip up the glaze by mixing together mirin, soy sauce and sugar, marinate your salmon in this mix for 5 minutes, then cook. On reflection, the sugar content of the mirin sauce may render this slightly less healthy than I first thought (4 tablespoons for 4 people) but if you’re really on a health kick, just cut the sugar by half. The sauce won’t be quite as sticky but it will still be delicious. This is fantastic served with fluffy rice and some steamed greens. Enjoy! 1. 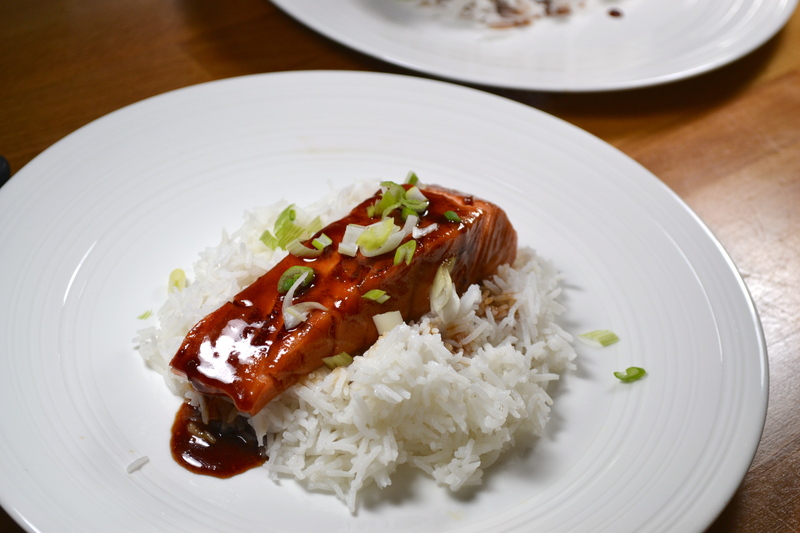 Mix the mirin, sugar and soy sauce together in a shallow dish that will fit all 4 salmon fillets in one layer. Marinate the salmon for 3 minutes on the flesh side and 2 minutes on the skin side (longer won’t hurt). 2. 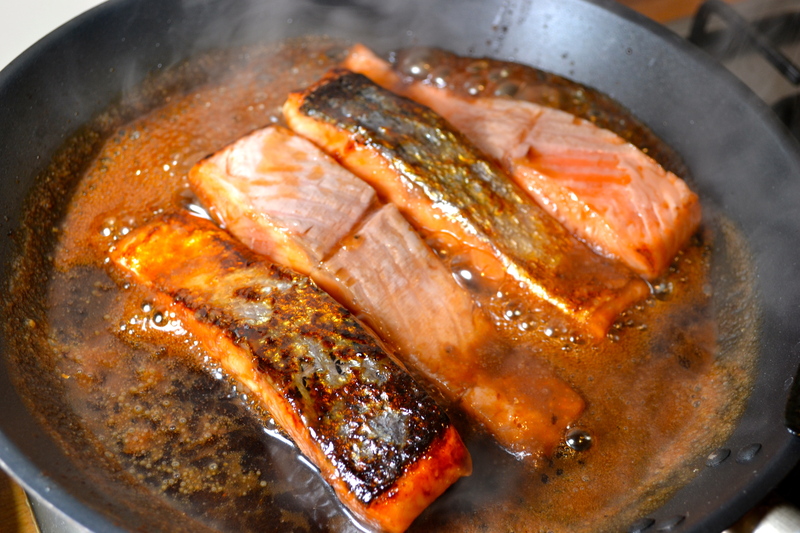 Heat a large non-stick frying pan on the hob (don’t add any fat) and cook the salmon skin side down for 3 minutes. Turn the fillets over, add the marinade and cook for a further 2 minutes. 3. Remove the salmon to the plate(s) you will serve it on and add the rice vinegar to the pan, mix with the marinade and warm through. 4. Pour the glaze from the pan over the salmon and scatter the spring onions over the top. Serve with rice or noodles and some steamed greens.